Have you ever wanted to don chainmail and run around with a giant two handed blade while completely disregarding others safety? 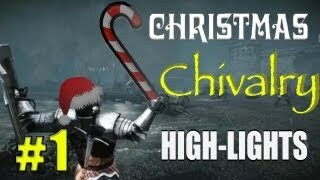 Then Chivalry: Medieval Warfare is the game for you! Developer Torn Banner Studio’s first full release is an iteration of the groups original vision, Age of Chivalry, which was a Half Life 2 modification. Now with more time and more funding the group have moved development to the Unreal Engine, looking to deliver the most visceral hand to hand fighting found in a game to date. Chivalry is a multiplayer focused title based around medieval warfare. In it you will choose between two warring factions, the Agathians and the Mason Order, as they try to skewer one another in a never ending war. At the outset it is best you enter the tutorial, as it is very important to learn the in’s and out’s of battle. The tutorial sequence will not only introduce you to the basic techniques needed, but also to each class and their unique abilities. The tutorial will also set up the inevitable feud between the two orders as well, with a small story thread throughout your training. Combat is the highlight of Chivalry, as there aren’t many games that allow you to have one on one sword fights with complete strangers. While there are other titles with a familiar setting on PC, they are generally much more simulation focused and slower paced, and Chivalry is anything but slow paced. This is Call of Duty if instead of guns the military chose to put blades and maces into the soldiers hands. When a battle begins you will choose your preferred class, and there are four to choose from: the Archer, the Man-at-Arms, the Knight, and the Vanguard. Each class has its own perk and its own weapon set, so finding which best suits your style of play is crucial to success. I have always loved archery, so without question it is my favorite of the class’s, but also one of the most difficult, as hitting your opponent as they run through the warfront is very hard, but extremely rewarding. While the archer is useful at long range, they are extremely weak when attacked directly, this is where the other three class’s come in. The Man-at-Arms is a lightly armored fighter, with the ability to dodge out of the way of attacks. The Vanguard specialize in far reaching weapons such as the spear or halberd and can charge into battle with great speed and force. Lastly there is the Knight. Knights are the slowest class in the game, but they offset this deduction by wearing the heaviest and most protective of armor. They also primarily use lethal two handed longswords that can easily defeat a foe with one swing. 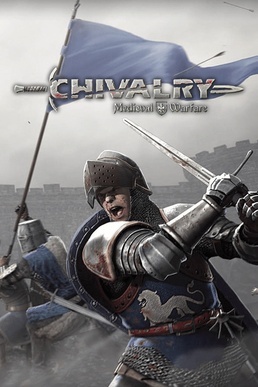 Chivalry features traditional team deathmatch as well as more elaborate objective based modes such as storming a castle and slaying the royalty within or burning down a village. (Or protect both of those locations if you play as the Agathians) Both of these choices offer enjoyable diversions but the longer more objective based skirmishes have more to sink your teeth into. Within certain environments you will also have the option of using various weapons such as ballistas and oil pots to take out your foes, and these help keep things fresh. Another aspect of Chivalry that helps keep the game fresh is the experience gained upon a match’s completion. Each class can unlock further diverse weaponry, such as new swords and shields, to projectile weapons or smoke screens. This level of progression is always a nice feature to have, and it once again helps here. Besides honing a strong combat system, Torn Banner Studios have also provided Chivalry with a fairly strong layer of visual polish. The level of detail for the character models is strong, with the ability to see the interlocking chains on your armor and a large assortment of well realized weapons. The environments on display also offer a good variety and the texture work and lighting are impressive for such a small team. But the most visually exciting aspect to Chivalry is connected to its combat, and that is its violence. With swings of a blade or chops from an axe, there go the limbs that were once attached to a computerized representation of a human. Heads, arms, and legs are not safe from the punishing results of these lethal weapons. My first experience with this system came in my first official match, set inside a gladiator arena, both teams begin and run at one another. I was charging with a teammate and as we both separated to pass a large column I expected to see him again on the other side, but he wasn’t. I turned around to look where he had ran and saw my Mason Order buddy screaming as both his arms were missing. While it is indeed violent, the blood is not excessive, so it comes off as just cartoon fun, similar to Monty Python and the Holy Grail’s poor black knight. While Chivalry offers up some good unique fun, it also has its share of problems as well. One issue people may have is actually with the combat system itself. While Torn Banner’s system has plenty of depth, it can also come off as shallow to some. Without knowing all of the details and practicing one may get the impression its a very simplistic system of just randomly swinging your sword, and although its not, that can still be a viable tactic. It comes off as similar to fighting games, while there is a tremendous amount of variety and in depth features, a button masher can sometimes get the better of you. But when you see four individuals trying to take down one warrior, and he is able to block and counter and turn the tide of battle, you know there’s far more under the hood than may be expected. Another problem I have had is with server stability. While some have claimed their experiences have been lag free, mine has not unfortunately. It no doubt could be due to my own internet connection, but I should be able to go one match without lag, as I am able to do just fine on other games. With Chivalry, lag becomes a larger factor than it does in most shooters, as split second corrections with your swings and dodges can mean the difference between life and death. I truly hope the connection issues can be worked out, because as of right now it can be rather troublesome. Chivalry is just good dumb fun, and a very nice change of pace from most online titles. Torn Banner Studios have vowed to keep the game fresh with patches that fix issues and new features being added, and later this month they are delivering. A new update will arrive before January ends that will deliver two new implements of war with the Flail and Polehammer as well as offer up a new stage and Capture the Flag mode. The game can feel janky at times, and the animations may not be as clean as they should be, but small attention to detail such as battlecry’s during fights and the ability to follow your arrow or bolt to its intended target help give the game an exciting atmosphere. Its a shame that lag has been a worry for me and others, and that some bugs can crop up from time to time, but otherwise, Chivalry is a title with a promising future ahead of it.